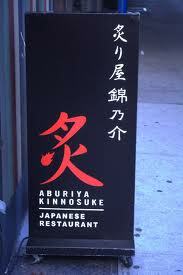 I have gone to many Japanese Restaurants but I have to say Aburiya Kinnosuke is hands down.. My FAVORITE. 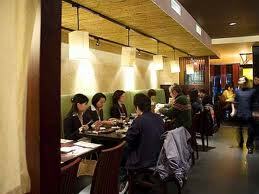 The food is awesome, well presented and you have damn near an entire Japanese staff. It almost felt like home when I came here. It was funny actually. I knew a guy who wanted to date me. After some time of him asking me over and over I figured I would go on one date with him. He wanted to prove to me that he was interested in my Japanese background so he took me to Aburiya Kinnosuke for dinner. We never went on another date after that, HOWEVER he introduced me to a place I didn’t know existed. I actually felt like I was back in Japan the time we were there. This spot can be overlooked if you are not paying attention…It is almost like a basement place on E45st in New York City. If you are into good Japanese food with a little authenticity?! This is a place for you. You decide the setting you want. 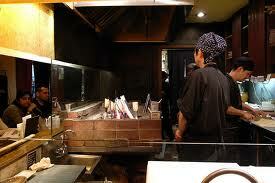 Be out in public in front of the grill and watch Masayuki do his thing. His name may not be Masayuke…maybe Daisuke? Who knows..it doesnt matter because you will feel like you are watching a painter create art…And that is exactly what will be going on. Maybe you want more of a business setting where you can enjoy a quick bite and sake while you discuss recent marketing strategies, or maybe you just want to hang out with a few friends and get wild without the entire restaurant knowing where all that noise is coming from. Maybe you speak Japanese..Maybe you don’t. It doesn’t matter. The entire staff may speak Japanese but they speak english too. Try out your Japanese with the waiter or waitress..Have a little fun. I also found out when I was there that most of the staff is from different prefectures and regions of japan. I met a waitress from Tokyo, Osaka, and Kyoto. Born and bread in Japan and now in NYC to give you the Japan experience right in your backyard. Can’t beat that! The staff also speak to each other in Japanese so while you are waiting for your food you may hear someone yelling directions in Japanese. Aburiya Kinnosuke can be a little pricey…but I think it is worth it. I do not mind paying a little extra for Sashimi or Beef Tataki if its the best and freshest in the area. I will be going here again soon and will take good photos of the place, staff, and food. Have fun exploring this little taste of Japan.